Hoarding is defined as the persistent difficulty discarding or parting with possessions regardless of their actual value. The difficulty is due to a perceived need to save the items and to distress associated with discarding them. Hoarding disorder or pathological hoarding occurs when possessions are accumulated to such an extent that they congest active living areas so much so that their use is substantially compromised. 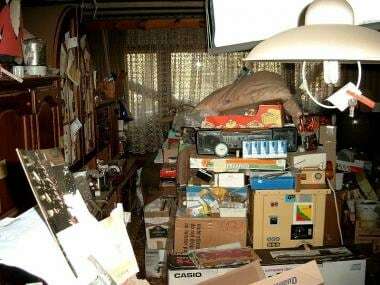 Hoarding disorder is often best assessed by a home visit, where household living areas often appear like the image below. This photo shows the cluttered living space of a compulsive hoarder. Courtesy of Wikimedia Commons. The problem of excessive accumulation of material goods has been recognized since antiquity and epitomized by Diogenes who was known for saving and recycling (among other things). Although many healthy individuals collect material goods (e.g., stamps, porcelain dolls) and others have difficulty parting with objects due to their sentimental or material value, it has also been recognized that a small proportion of individuals in our society accumulate to such an extent that it impacts on their ability to use the living areas of their homes, causes distress, places them in danger and/or restricts their quality of life. American Psychiatric Association. Obsessive-Compulsive and Related Disorders. Diagnostic and Statistical Manual of Mental Disorders, Fifth Edition. Washington, DC: American Psychiatric Association; 2013. 247-251. Pertusa A, Frost RO, Fullana MA, Samuels J, Steketee G, Tolin D, et al. Refining the diagnostic boundaries of compulsive hoarding: a critical review. Clin Psychol Rev. 2010 Jun. 30 (4):371-86. [Medline]. Saxena S, Brody AL, Maidment KM, Smith EC, Zohrabi N, Katz E, et al. Cerebral glucose metabolism in obsessive-compulsive hoarding. Am J Psychiatry. 2004 Jun. 161 (6):1038-48. [Medline]. Mataix-Cols D, Wooderson S, Lawrence N, Brammer MJ, Speckens A, Phillips ML. Distinct neural correlates of washing, checking, and hoarding symptom dimensions in obsessive-compulsive disorder. Arch Gen Psychiatry. 2004 Jun. 61 (6):564-76. [Medline]. An SK, Mataix-Cols D, Lawrence NS, Wooderson S, Giampietro V, Speckens A, et al. To discard or not to discard: the neural basis of hoarding symptoms in obsessive-compulsive disorder. Mol Psychiatry. 2009 Mar. 14 (3):318-31. [Medline]. Frost RO, Gross RC. The hoarding of possessions. Behav Res Ther. 1993 May. 31 (4):367-81. [Medline]. Grisham JR, Norberg MM, Williams AD, Certoma SP, Kadib R. Categorization and cognitive deficits in compulsive hoarding. Behav Res Ther. 2010 Sep. 48 (9):866-72. [Medline]. Tolin DF, Meunier SA, Frost RO, Steketee G. Course of compulsive hoarding and its relationship to life events. Depress Anxiety. 2010 Sep. 27 (9):829-38. [Medline]. Nordsletten AE, Reichenberg A, Hatch SL, Fernández de la Cruz L, Pertusa A, Hotopf M, et al. Epidemiology of hoarding disorder. Br J Psychiatry. 2013 Dec. 203 (6):445-52. [Medline]. Hartl TL, Duffany SR, Allen GJ, Steketee G, Frost RO. Relationships among compulsive hoarding, trauma, and attention-deficit/hyperactivity disorder. Behav Res Ther. 2005 Feb. 43 (2):269-76. [Medline]. Nordsletten AE, Mataix-Cols D. Hoarding versus collecting: where does pathology diverge from play?. Clin Psychol Rev. 2012 Apr. 32 (3):165-76. [Medline]. Illinois General Assembly. Humane Care for Animals Act. ILGA.gov. Available at http://www.ilga.gov/legislation/ilcs/ilcs3.asp?ActID=1717. 2001; Accessed: February 29, 2016. Patronek GJ. Hoarding of animals: an under-recognized public health problem in a difficult-to-study population. Public Health Rep. 1999 Jan-Feb. 114 (1):81-7. [Medline]. Health implications of animal hoarding. Health Soc Work. 2002 May. 27 (2):125-36. [Medline]. Snowdon J. Accumulating too much stuff: what is hoarding and what is not?. Australas Psychiatry. 2015 Aug. 23 (4):354-7. [Medline]. Frost RO, Hristova V, Steketee G, Tolin DF. Activities of Daily Living Scale in Hoarding Disorder. J Obsessive Compuls Relat Disord. 2013 Apr 1. 2 (2):85-90. [Medline]. Frost RO, Steketee G, Grisham J. Measurement of compulsive hoarding: saving inventory-revised. Behav Res Ther. 2004 Oct. 42 (10):1163-82. [Medline]. Williams M, Viscusi JA. Hoarding Disorder and a Systematic Review of Treatment with Cognitive Behavioral Therapy. Cogn Behav Ther. 2016 Jan 21. 1-18. [Medline]. Brakoulias V, Milicevic D. Assessment and treatment of hoarding disorder. Australas Psychiatry. 2015 Aug. 23 (4):358-60. [Medline]. Tolin DF, Frost RO, Steketee G. An open trial of cognitive-behavioral therapy for compulsive hoarding. Behav Res Ther. 2007 Jul. 45 (7):1461-70. [Medline]. Muroff J, Steketee G, Himle J, Frost R. Delivery of internet treatment for compulsive hoarding (D.I.T.C.H.). Behav Res Ther. 2010 Jan. 48 (1):79-85. [Medline]. Brakoulias V, Eslick GD, Starcevic V. A meta-analysis of the response of pathological hoarding to pharmacotherapy. Psychiatry Res. 2015 Sep 30. 229 (1-2):272-6. [Medline]. Saxena S, Sumner J. Venlafaxine extended-release treatment of hoarding disorder. Int Clin Psychopharmacol. 2014 Sep. 29 (5):266-73. [Medline]. [Full Text]. Saxena S, Brody AL, Maidment KM, Baxter LR Jr. Paroxetine treatment of compulsive hoarding. J Psychiatr Res. 2007 Sep. 41 (6):481-7. [Medline]. [Full Text]. Disclosure: Received research grant from: Nepean Medical Research Foundation, Pfizer Neuroscience Grant Scheme, The University of Sydney.